The Latin American Studies program provides you with an interdisciplinary framework for studying the societies of a culturally rich and diverse region shaped by the meeting of Amerindian, African, and European peoples. You will gain an in-depth understanding of the region known as Latin America (Mexico, Central America, South America, and the Caribbean). Using the perspectives and methodologies of multiple academic fields, you will develop a more profound political, social, historical, economic, and cultural knowledge of Latin America than you could realized in any single discipline. All majors are required to participate in a study abroad program in a Spanish- or Portuguese-speaking nation in Latin America, which provides hands-on experience in Latin American cultures. You are encouraged to spend a semester or longer abroad, but with prior approval, a summer program may be substituted. Courses are drawn from several different departments including Modern Foreign Languages (Spanish), History, Economics, Politics & Government, Geography, Religion, Philosophy, and Sociology/Anthropology. A major in Latin American Studies provides students with the solid liberal arts skills useful in most professions, as well as specialized language and knowledge desirable for a career related to the region of Latin America. In addition, majors are well suited to pursue graduate education in the social sciences, humanities, law, and business. GEOG 250.1, PG 348; two (2) of the following history courses (HIST 115, 331, 332, 333, 334, 335a, 335b, or 335c); and two (2) Spanish courses beyond the level of SPAN 111. Minors are encouraged but not required to study abroad. Professor Rojas specializes in Latin American Literature and its cultures. Presently his main professional and personal interests are Academic Leadership, Mexican and Border Studies, and Poetry. In 2015, he received a Mellon Foundation grant to create an interactive digital map of the poetics of Hispanic American literature. Professor Howard specializes in psychological and medical anthropology, which stem from 16 years of work in mental and medical health care settings. She has led student trips to Haiti, The Dominican Republic, India, and Mexico and has traveled in Europe, Pakistan, Nepal, Brazil, Peru, and throughout the African continent. Enjoy performances and sample foods representing different parts of the world at Ohio Wesleyan's annual Culture Fest, hosted by Horizons International with support from the Wesleyan Council on Student Affairs. 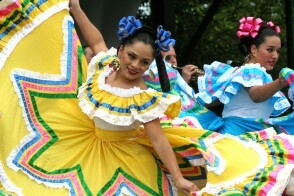 VIVA is the Latin American culture group on campus. Their mission is to foster understanding of Latin American cultures and issues on the OWU campus, as well as to provide programs and venues through which the campus can get involved. All students with interest and willingness to participate are welcome and encouraged to join, regardless of ethnic backgrounds or experiences. Students can apply to live in the Modern Foreign Languages House, a Small Living Unit on campus. MFL house is a place where like-minded students can explore and share their interests in language, diversity, and culture. The house hosts language talks and other cultural events on campus. The Citizens of the World (COW) House is a Small Living Unit on campus that provides international, social, and cultural events and discussions from members who are from both near and abroad. The house promotes acceptance and embraces cultural diversity.